The trial was done in the Cuddon FD80 which has an ice trap capacity of 80kg in 24hrs. The trays sit directly on the heat shelves so the drying style is conductive meaning direct heat input and less heat required from drying. As there was a limited amount of product (20kg per trial), I filled the rest of the trays with ice to give a similar load on the freeze dryer as if it were all pet food. 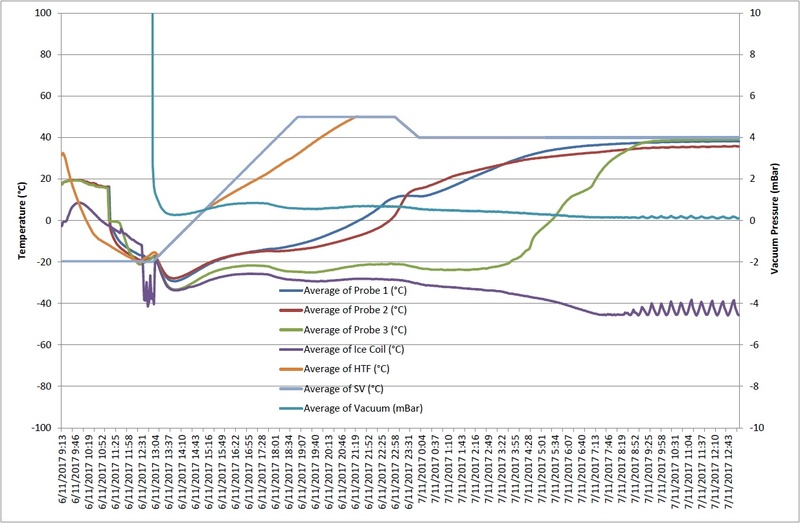 In the data graphs one product probe was in the ice and has a very noticeable increase in temperature as the ice melts around it and the probe connects with the heated tray. The main difference in the recipe was the drop in temperature as the product came out of primary drying and in to secondary drying. This is roughly when the temperature comes out of sub-zero temperatures and starts to take on the sensible heat from the heat plates. The first trial was done by taking the shelf temperature up to 50C and holding it for 6hrs and then dropping it down to 40C for the remainder of the time. Although the indications were that the product was dry around 22hrs, I left it going until just before the 24hr mark. The product was dry but still had a soft feel to it. It was not hard like a biscuit and the recipe of the product will have a lot to do with this and what ingredients was used. The second trial was prepared the same as the first but the temperature was left at 50C for the duration of the cycle. The indications on the graph showed it to be dried within 18hrs and this proved correct when I removed the trays. The product was a lot more firmer and felt dryer than the first trials yet the moisture levels were the same. The higher heat had "baked" the product more and gave it a dryer feel. 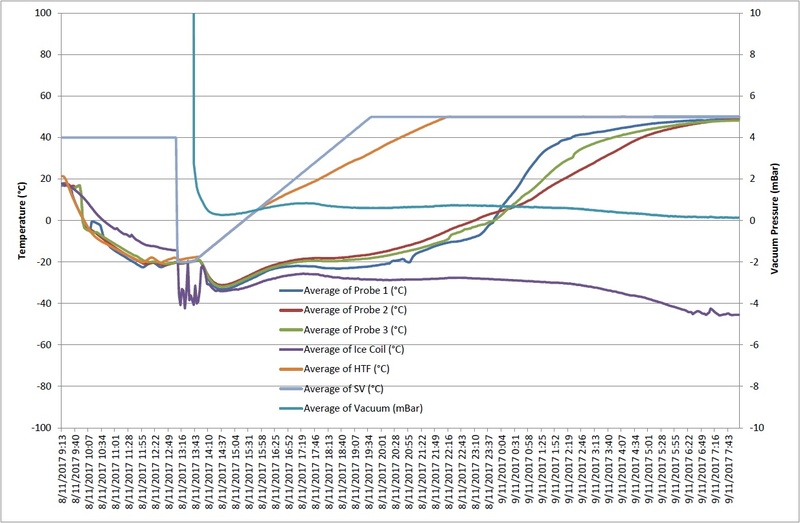 You can see the primary drying is similar in both graphs but more gentler in the secondary drying phase in the first trial verses the second trial. This is a good example of high heat, fast drying verses lower heat and slower drying giving a better quality finish. Freeze drying is not about speed and there is a big difference in the quality of the finished product with higher heats. The choice in the end is with the client and how they run their dryers and the what type of dryers they purchase. 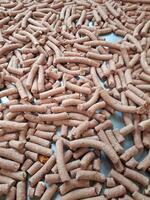 Cuddon freeze dryers are renowned for their quality in both the dryer and how it dries product. If you wish to know more about our dryers then please check out our products page or send us an email by clicking the enquires link below.